Remember that instead of actual weight, I’m plotting the % of weight the sausage has lost on the way to losing 1/3 of its initial weight. 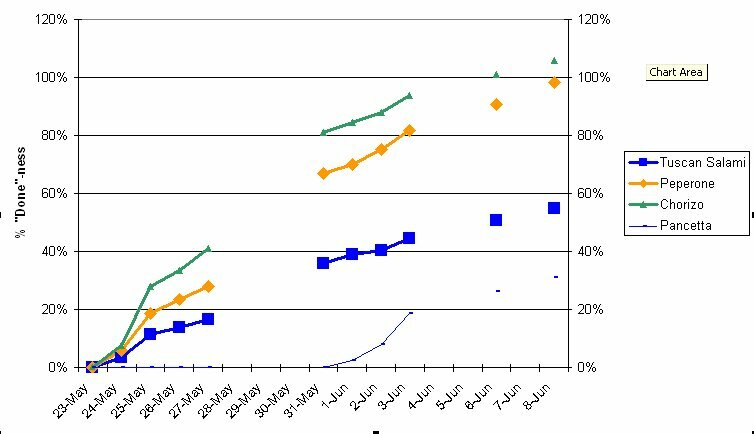 Extrapolating the data out linearly shows the salami will be done sometime at the end of this month/beginning of next. 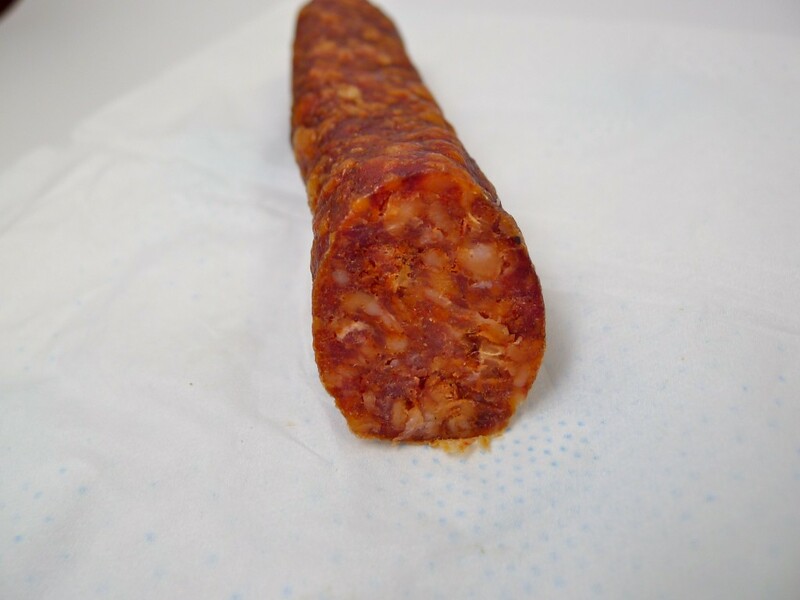 The water activity of the salami is still well over 0.9, although the peperone (0.89) and chorizo (0.84) are much lower. I’ll post water activity data later this week, but as the amount of water lost each day declines, we expect the water activity to continue a steady decline. Most products are like this: in the wet range, losing a lot of water doesn’t change the water activity much. As they “dry” into the 0.8 aw range, a small change in moisture causes a proportionally larger shift in water activity. All of the humidity in the fridge results from the meat that’s there. I don’t have any salt solutions in there at all. A couple of times, frustrated by the persistently high humidity, I just left the fridge door open for a few hours to dry everything out. Usually this makes the equilibrium humidity when I shut the door a little lower than when I started. The fridge likes to dry things out, but there’s obviously a limit to how much water vapor the fridge can expel in a particular amount of time. The mold growth hasn’t been an issue this time around, but maybe I’ll put some desiccant in the fridge for the first couple of days when we make the next batch.